It may not feel like it, but spring is just around the corner! After a long winter of damaging cold, wind and snow your spring cleaning routine will most likely include your outdoor property. Before you whip out the power washer and lawn mower take a minute to check up on your outdoor electrical needs. If your outlets are not up to snuff you may want to consider upgrading to a more protective outlet cover. The Leviton Extra-Duty Outlet Box Hood accommodates Single, Duplex, Decora® or GFCI outlets to best suit your outdoor power needs. The Leviton offering of Weatherproof Covers & Boxes comprises both 1- and 2-gang configurations that comply with the National Electric Code® for weatherproof enclosures in damp locations. The harshest environments will no longer hold you back from getting your property warm-weather ready! Aside from providing the ultimate protection to your outdoor devices, we also made the device covers easy to install and versatile to meet your specific needs. Convenient mounting holes allow users to easily attach cover to pre-installed screws. Additionally, pre-installed weatherproof gaskets feature custom fit inserts allowing for an easy to use installation. The Extra-Duty Outlet Box Hood is made with a convenient opening at the bottom to allow easy access to your power cord. 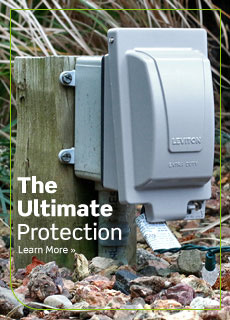 Unique to the other Leviton weatherproof covers is the safety lockout feature of this device that prevents unauthorized use. Afraid the kids may tamper with the outlet? Simply lock the device cover and you’ll be worry free. Cover all of your property’s electrical outlets with extra duty protection outside of your home, next to the pool, alongside the garage, on the patio or next to your backyard entertainment system. Don’t leave the reliability of your outdoor electricity up to chance. When you need to get your tasks done make sure your power is ready when you are. For extra protection against the weather’s worst, protect your outdoor outlets with a Leviton Extra-Duty Outlet Box Hood.